Fried Kway Teow / Char Kway Teow…and a Giveaway! I can’t believe the last I wrote was when I was about to hop on a plane to one of my favorite cities in the world. Yes, for work, but, as is the case with Barcelona, there will always be a bit (lot) of fun on the side. You can hop over to my Instagram if you’d like to take a peek at all my gastronomic overindulgence (my jeans are still complaining!). It was a fantastic trip – the weather was perfect (sunny but very cool), the work was inspiring (a growth summit in which one of the speakers as a former hostage negotiator! ), and the food was amazing (this, this, THIS…and so much more!)! – Heat 2 tablespoons of the oil in a wok over high heat and stir-fry the garlic until light brown, about 1 minute. Add the seafood, chili paste, and Chinese sausages and stir-fry for another 2 minutes. – Add the noodles and choy sum to the wok and stir. Then season with the soy sauces and sugar and stir to mix well (what I do is mix the soy sauces and sugar together before stirring into the noodles as I feel this lets it mix in more evenly). – Push the noodles to the side of the wok, reduce the heat to medium, then add the rest of the oil and the beaten eggs into the space you made in the wok for them. Scramble the eggs and when just about setting, stir into the rest of the ingredients. Stir-fry for about 1 minute. – Add the bean sprouts and chili and stir-fry for another 1-2 minutes. Season with salt and pepper, and serve immediately. The recipe above came from one of my more recent cookbook acquisitions with the most auspicious name of The Asian Kitchen: Fabulous Recipesfrom Every Corner of Asia…a gift from a friend at Periplus publishing. What I like about it is, of course, that it has almost all my favorite Asian dishes, including (no biases here!) a section on Philippine cuisine. It also has a good introduction to each cuisine (and it covers everything from China to Sri Lanka) and a useful guide to ingredients. 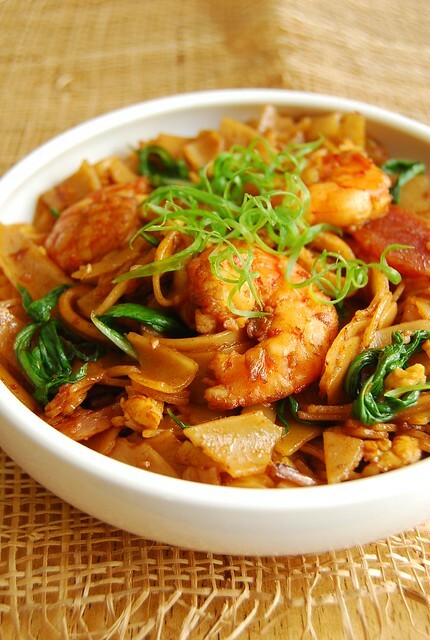 And, let’s not forget to mention, I can now whip up a yummy char kway teow any time I want! The best thing about it though is that the generous folks at Periplus have agreed to give away a copy of this cookbook to one of my lucky readers! Yes, you! Plus, along with the cookbook, we will be throwing in a lovely stainless steel spice rack as well…I’m already enjoying mine! So if you are interested in Asian cuisine, or just want to get your feet wet, this is a great place to start. Just leave a comment below, or shoot me an email (button at the top of the sidebar)…that’s it! No liking of pages or complicated procedures 🙂 We will choose a winner randomly by putting your names in a hat. Yes, I am extremely old school that way. A lovely sounding cookbook and a mouthwatering dish! This just made me miss Singapore that much more. I think it's one of the few places where foodcourts really offer gadtronomic treats! YUM!!! I love to learn more about Asian cooking! Your sample recipe looks easy enough that I, a non cook would be able to recreate this! If I wrote more comments, do I get more chances of winning this cookbook? 🙂 How are you?!!!!! Your blog still rocks. Mine's gathering cobwebs. Oh I have not found a great SEAsian resto (that's anything other than Vietnamese) here in my corner of Texas. Hope to stumble upon a great Malay / Thai / Indo / Sing resto soon. Oh, me, me, me! Truth be told, ii'm squarely in my comfort zone making Western cuisine, but that char kway trow of yours is a an inspiration! Brand new to your blog… brand new to instagram and your the first I am following! I'd love to win the Periplus cookbook!! Please throw my name into the pot for the prize cookbook. Would love to try out many of the reipes. Thanks. Thank you everyone for your comments and entries! Also to those who have emailed in! 🙂 I'm super excited for the cookbook to reach one of you (I'm already planning what I am going to make next!) as well as the spice rack (which I love and makes me happy just seeing the spices and herbs peeking out every time I'm in the kitchen)! 🙂 I'll be announcing the winner next week so there is still time to enter! Ling — I would have loved to stay longer…so much food! Didi — good luck finding a nice SEA place there…I'm sure there should be some? Jo! I love Asian food, both cooking and eating 🙂 The flavors rock!! Mirtha — thanks for stopping by! Everyone — thanks as always for your comments…draw is next week!